Is walking 10,000 steps a day enough? Is it better to jog around the neighborhood or pound the treadmill for 30 to 60 minutes? What about lifting weights at the gym? Well, what it boils down to is how your body is designed to move. Think back to the days of our recent ancestors, say 1850 or so. Yes, they did walk a lot. But no, they didn’t run around their settlements for a half hour or more every day. They didn’t stand around lifting 10, 20 or 50 pound rocks in an effort to build up their abs, biceps and triceps. Instead, they experienced bursts of activity that were required to sustain every day life. They walked, ran, stooped, lifted, pushed and pulled to get through the tasks necessary just to get them through the day. And you have to admit, it kept them in great shape! In today’s world, we don’t get nearly enough of these types of activity. Everything we need is readily available to us, with hardly any effort on our part. It’s extremely easy to do a lot of sitting and very little moving. The daily use of our cars, TVs, and laptops are just a few of the enablers of this unhealthy behavior. And it’s a pretty sure thing that this lack of movement is contributing to the sad state of health so many U.S. adults are experiencing these days. Today we are living a lot longer than we used to. But we are also losing our health and mobility much earlier than we should and declining over a longer period of time. And let me be clear about that. If you’re not getting enough physical activity, your muscles are already growing weak and your bones are becoming frail. Weight gain may plague you, which only makes matters worse. All of these events open you up to balance issues, falls and fractures as you age. At the same time, a lack of moderate-to-vigorous physical activity on a regular basis is aging your heart, clogging your blood vessels, shrinking your brain, messing with your blood sugar, placing you in an inflammatory state and increasing any joint pain you may be experiencing. This is a sad state to be in. But that doesn’t mean you can’t change the outcome. 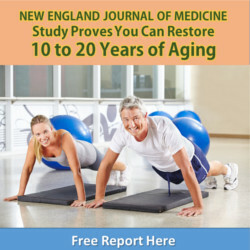 It is entirely possible that if you get up and get moving you can not only extend your life, but enjoy your later years in great health. So let me share a secret with you… Your physical activity throughout the day is cumulative. But for it to really work for you it has to contain three elements. 1) It must be physically challenging. 2) It must include bursts of intensity. 3) It must last five to 10 minutes. This is called sporadic moderate-to-vigorous physical activity. It’s something that most people only get about three minutes of each day. But with just a few minor changes, the things you do every day can rack up more of those minutes so they can be counted toward your daily exercise goal. Whenever you need to walk for five or ten minutes, tackle it at a pace so brisk that you can barely carry on a conversation. Don’t trudge up the stairs. Tackle them with some energy! Even walking up the stairs with great posture and slow deep breaths helps. Every time you get the chance, take a jog or brisk walk… even if it means parking at the end of the lot and going the extra 100 feet toward your destination. 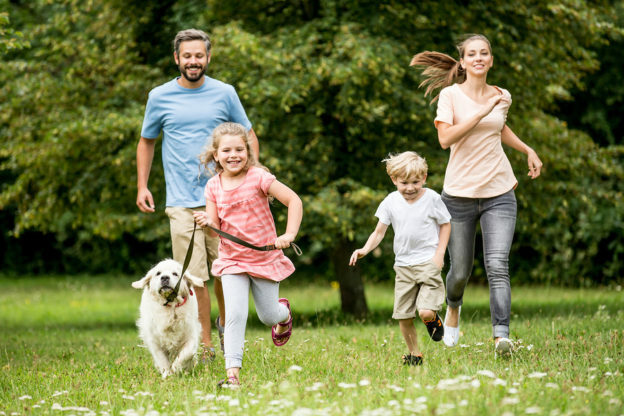 Play actively with the dog, or the kids, make taking out the trash an event to walk about the neighborhood, dance while you cook, (anybody remember the opening scene to the movie The Big Chill?) Just add challenge and intensity whenever and wherever you can. The more of this type of sporadic physical activity you participate in, the lower your risk of early death becomes and the better your health will be. I also recommend you continue regular high-intensity-interval training (HIIT) sessions. The thing I love about HIIT is that it really works to boost lung, heart and brain health. At the same time you can incorporate exercises such as squats, planks and push-ups that support the musculature structures and bone health you need for every day movement and activities. Saint-Maurice PF, et al. Moderate-to-Vigorous Physical Activity and All-Cause Mortality: Do Bouts Matter? J Am Heart Assoc. 2018 Mar 22;7(6). Robson J, et al. A description of the volume and intensity of sporadic physical activity among adults. BMC Sports Sci Med Rehabil. 2015; 7: 2.